Hell is empty, and all the devils are here. Well, Hell isn't empty, and it's really only one half-devil that's here. 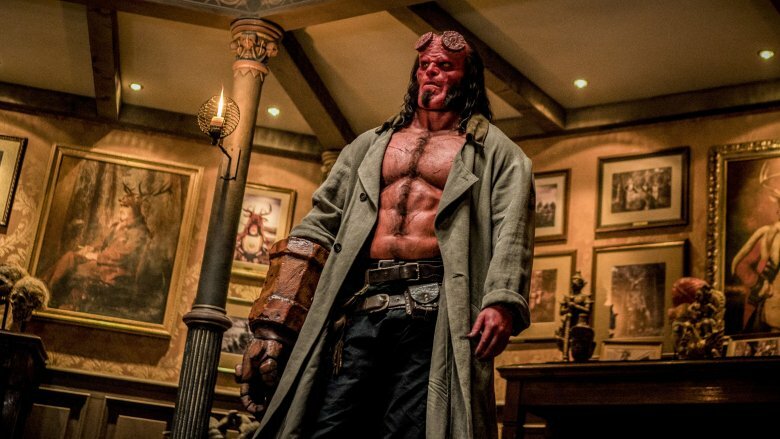 That's right, Hellboy has finally hit theaters with all the demon-punching, sword-wielding, wisecracking action you could ask for. 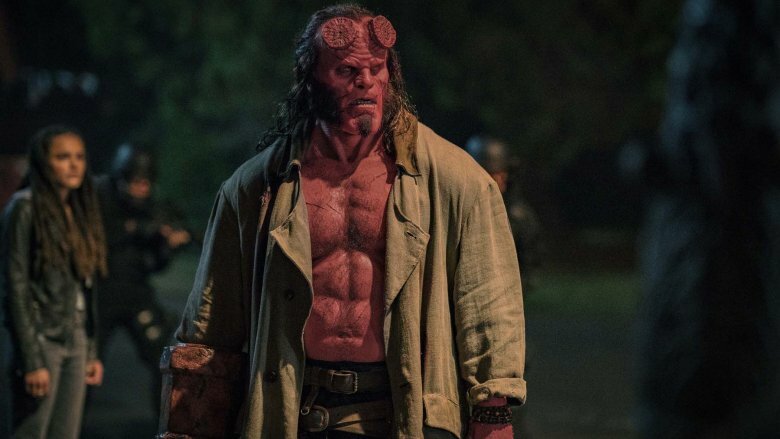 Directed by Neil Marshall (The Descent) and starring David Harbour (Stranger Things), Daniel Dae-Kim (Lost), and Milla Jovovich (The Fifth Element), Hellboy is the first live-action Hellboy film to be released in over a decade. Fans have been waiting years to find out which new twists would be added to the story by the new creative team for the rebooted franchise. But while the movie has some very big moments (and very big monsters), what about the small stuff? No, we're not just talking about the fairies and tiny creatures that run around in the background. We're gritting our teeth, dusting off our tomes of Hellboy history, and casting a spell of blood magic to bring you all the small details you missed in Hellboy. Hellboy starts off the movie heading down to Mexico in order to find a missing B.P.R.D. agent and close friend, Esteban, who disappeared while investigating a group of vampires. He finds his old pal wrestling in a lucha libre arena under the name Camazotz, seemingly indifferent to Hellboy's concern about his well being. At this point, audience members might have gotten a feeling of dread that Esteban wasn't quite himself, but Hellboy comic readers were likely way ahead of anyone else. In the comics storyline Hellboy in Mexico, Hellboy teams up with a group of luchadores while fighting vampires in Mexico during the '50s. After a night of heavy drinking, one of the brothers (named Esteban) wanders out into the night and gets turned into a vampiric luchador called Camazotz. 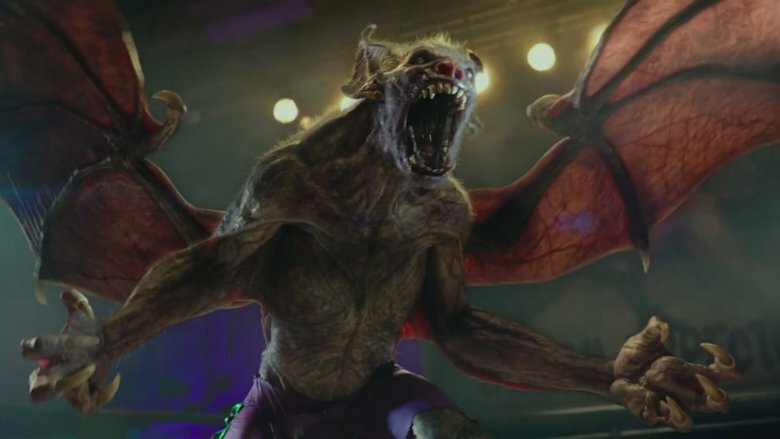 The movie more or less follows the storyline to a tee, as Hellboy is forced to battle against the giant bat creature, and, ultimately, impales him onto a nearby ring post. The movie even includes the months-long drinking bender that Hellboy goes on afterwards. Whatever else your criticisms of the movie might be, you can't say that it isn't closely inspired by the comics. Once Hellboy gets picked up in Mexico by a couple of B.P.R.D. agents, Professor Bruttenholm lets our hero know what his next job is: he has to go to the Osiris Club, and help them out with a giant problem that they're having. As their conversation reveals, the Osiris Club is an offshoot of the Heliopic Brotherhood of Ra, an organization that Hellboy's familiar with. He's got good reason to be. In the comics, the Heliopic Brotherhood is a group of supernatural-obsessed cultists who went around causing trouble in all manner of ways. They usually battled against Sir Edward Grey, the Witchfinder, a Victorian-era precursor to latter-day heroes like Lobster Johnson and Hellboy. The Brotherhood's reference in the film isn't just to show that the new film is firmly enmeshed within the larger Hellboy comics universe, though. It's also a sly bit of foreshadowing to the Osiris Club's betrayal of Hellboy while on the Wild Hunt. The Osiris Club might be an offshoot of the Brotherhood, but they're just as willing to get their collective hands dirty to accomplish a goal. If you've got a phobia around eye trauma, you should definitely stay away from Hellboy. The opening scene features a raven pecking out a corpse's eye. Hellboy himself blinds at least three different monsters (and likely more) onscreen over the course of his exceedingly violent adventures. Plus, there's Baba Yaga, the witch who lost one eye to Hellboy before the movie's events, and is eager to pop one of Big Red's yellow eyes into her socket. She offers Hellboy a deal: information on Nimue the Blood Queen's next move in return for one of his eyes. Hellboy accepts, but ends up reneging on the deal, telling the witch that she can have the eye when he's done with it. While it might seem like a savvy move on Hellboy's part, that might not have been the right decision. He gets hit with a nasty curse courtesy of Baba Yaga (more on that later), but he also ends up losing out on some wisdom. Considering how much of his adventures are so heavily influenced by mythic storytelling and folklore, Hellboy probably should have remembered the Norse myth of Odin. In stories, Odin is said to have traded an eye for divine wisdom, and later depictions (and pop culture inspirations) have shown that the sacrifice of one half of your 20/20 vision helps you to see things a bit more clearly. Metaphorically, of course. Sounds like something Hellboy could've used a bit earlier. Speaking of Hellboy's deal with Baba Yaga, he's able to get out of the trade by telling the witch that she never specified a time frame for when she could collect his eye. Sure, it's a savvy bit of wordplay that gives our hero the high ground for not staying true to his word when making a deal with a child-killing cannibal witch, but it also subtly connects Hellboy to Nimue. 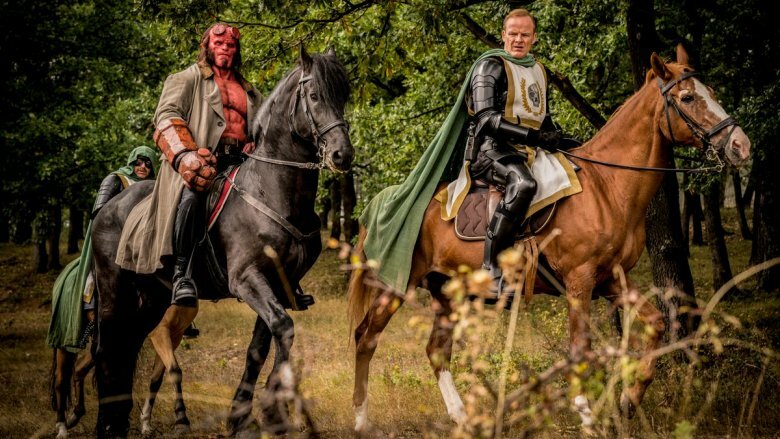 A significant portion of the film is devoted to Hellboy struggling with his dual loyalties to humanity, epitomized by Professor Bruttenholm, and monsterdom, represented by Nimue. She tells him that they're connected, bound by fate. That might be true, but they're also bound by how tricky they both are. After Gruagach defeats Hellboy in combat, Nimue takes the former's power away. When Gruagach pitifully reminds Nimue that she promised to "make him whole," she responds that she did… She just didn't tell him for how long. Nimue and Hellboy's dual trickery is a subtle way of connecting the two characters through reflective dialogue. We'll point out one last detail in Baba Yaga's chicken house before we move on to other scenes. When Hellboy leaves with both eyes, Baba Yaga curses him that he'll be able to use both of his eyes to see the one person he loves most in the world suffer and die. Later in the film, Alice is hit by one of Nimue's poisonous needles, and her outlook seems grim. With Alice knocking on Heaven's door, it seems like the film is setting her up to be the unfortunate recipient of Baba Yaga's curse. As it turns out, all she needed was a little Merlin magic to get back up on her feet. Instead, the curse's real target seems to be Professor Bruttenholm, who's killed by Nimue by the end of the film while Hellboy watches. If Hellboy is cursed to watch his dad die in front of him, then Baba Yaga's curse also nicely ties up the lingering plot hole of why Professor Broom was one of the only members of the B.P.R.D. not to be massacred by Nimue. Earlier, we mentioned that Hellboy's refusal to give up an eye closes him off from the opportunity to gain wisdom in the tradition of European mythology. That's not the only shoutout that European myths get in the film — the Wild Hunt is likewise straight out of those myths. There are many, many variations in the various regions, but one of the most consistent aspects of the Hunt is that it presages an outbreak of war or plague when seen by a normal human. The Wild Hunt of Hellboy is a bit distinct in that everyone involved in the Hunt, except for Hellboy, is a normal human. Still, the aspects of the Hunt presaging war and plague were obviously carried over into the film. 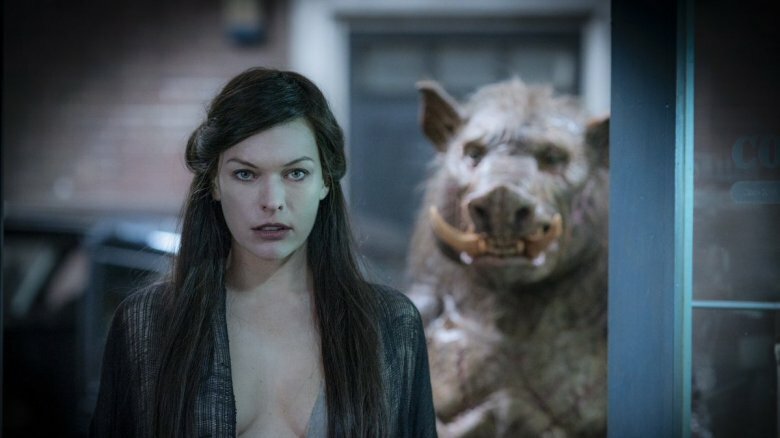 Nimue is known for bringing with her plagues and destruction, and there are definitely enough demons and soldiers milling about in the final scenes to qualify as a war. 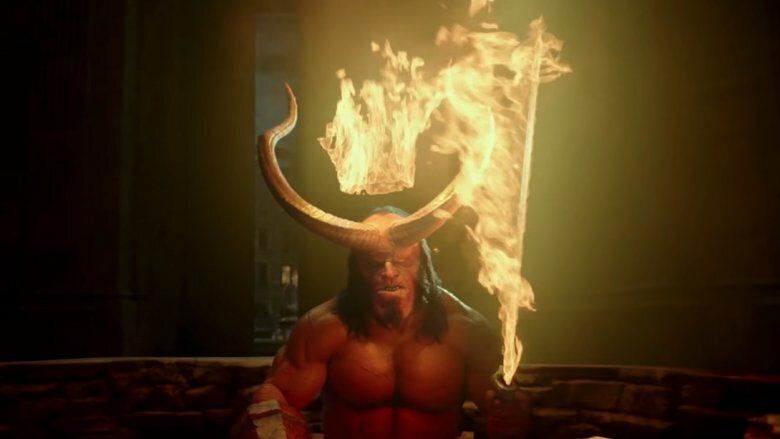 One of the most memorable lines in the trailer (and in the finished film) come when Hellboy rebuffs Nimue's offer of romantic alliance by telling her that, "this is not gonna work, ya know, cause I'm a Capricorn, and you're f***ing nuts!" While it may have gotten a laugh in theaters, it's not actually accurate. In the comics, Hellboy's given birthday is October 5, which would make him a Libra. It's easy to see why screenwriter Andrew Cosby went with the Capricorn symbol instead of Hellboy's canonical birthday; the zodiac symbol of the Capricorn is a goat. Hellboy's demon father takes the form of a goat, occasionally. Hellboy's horns are goat-like. It makes enough sense. However, Hellboy in the comics being a Libra is pretty perfect, at least in reference to horoscope characterizations. Libras are known for their thoughtful demeanor, even keel, and need for partners — qualities that perfectly match Hellboy's general vibe in the comics. On the other hand, Hellboy in Hellboy is a bit more feisty and independent, so maybe the movie-verse version of the character actually is a Capricorn. That's no key, that's my hand! Another line with greater meaning than you might have thought comes up when Hellboy first visits the Osiris Club. One of the Huntsmen asks Hellboy what his rocky right hand is used for, to which Hellboy replies, "It smashes things real good." That line might have come as a shock to super fans of the comics and 2004's Hellboy film, since they'd know that Hellboy's "Right Hand of Doom" is the key to unlocking and controlling the Ogdru-Jahad, Lovecraftian-esque creatures from beyond space and time. Basically none of that plays into 2019's Hellboy, largely because among the various doomsday prophecies that Hellboy plays into, his space-worm controlling stone hand isn't one of them. Instead, it's more of a battle between his demonic evil and Arthurian good twin heritages, with the forces of evil kept decidedly in the folklore and hellish realms. By writing this line into the film early, the filmmakers are able to keep audience expectations clear about exactly what kind of apocalypse figures into the movie's climax. While Hellboy's appearance on a small Scottish island after a Nazi ritual is kept fairly faithful to the original comics, there is one noticeable twist to our favorite demonic hero's origin story. That would be the appearance of pulp hero Lobster Johnson, a.k.a. the Lobster. 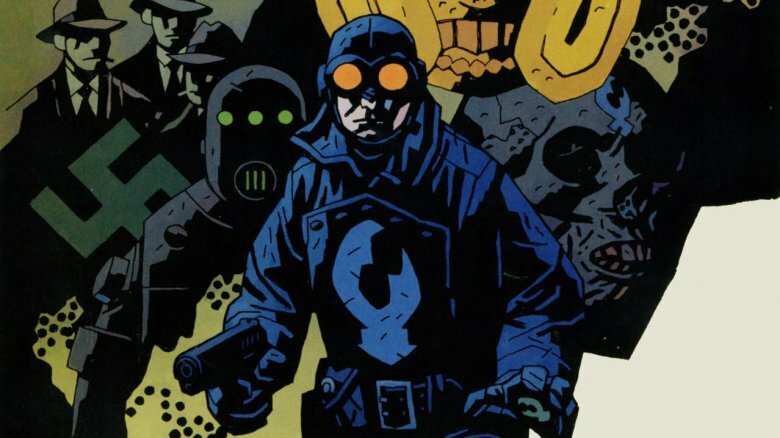 In the original comic, there's a pulp superhero along for the operation, but he's not the Lobster; he's a guy called the Torch of Liberty, a creation of John Byrne's that was loaned to Mike Mignola on a one-time basis for the story while they were collaborating on Hellboy: Seed of Destruction. 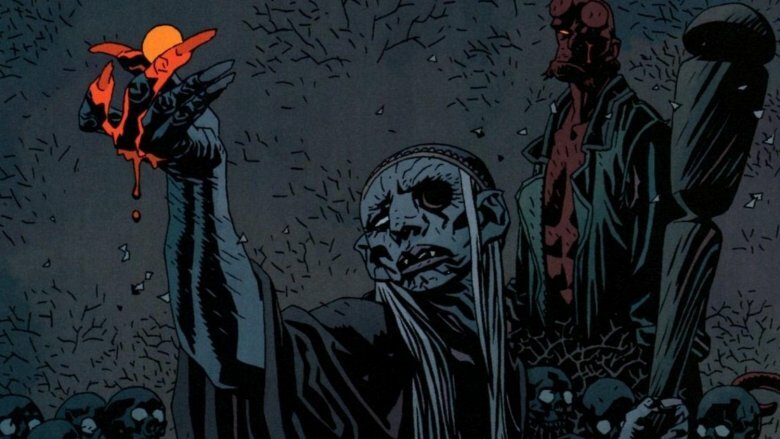 Since the character figured so prominently in Hellboy's origin, you'd expect him to make another appearance over the next 25 years of comics — instead, due to copyright issues, Mignola has steered away from ever reusing the Torch. Instead, whenever Mignola (and his many collaborators) needed to use a pulp hero to fight Nazis in the Hellboy universe, they used the Lobster. Making him an official witness to Hellboy's arrival on Earth is a pretty declarative statement that the film takes place within that larger universe. More importantly, they kept his extremely good catchphrase: "Beware my claw, for I've come to inflict justice!" If you were wondering why you didn't see many familiar faces from previous Hellboy movies in the 2019 film, there's a simple reason for that. The filmmakers are clearly trying to reboot the franchise, and they wanted to avoid audiences confusing it for a sequel. Still, if the ending of the film is any indication, they obviously knew that they could only get along for one movie without Hellboy's good friend and most dependable sidekick, Abe Sapien. 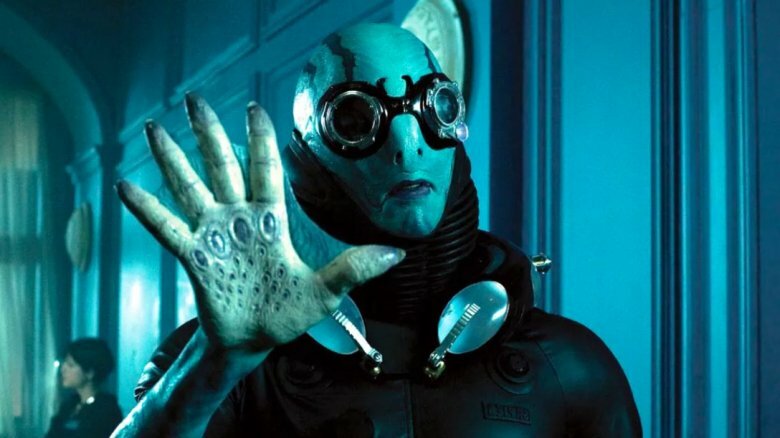 Played by Doug Jones in 2004's Hellboy and Hellboy II: The Golden Army, Abe Sapien is an icthyo sapien. If that phrase means nothing to you, just picture a guy who looks like a more humanoid Creature from the Black Lagoon. He's a longtime ally and close friend of Hellboy's, and the character is nearly as intrinsically tied to the larger Hellboy universe as Big Red himself. The closing scene of 2019's Hellboy features Hellboy, Alice, and Ben Daimio raiding a warehouse in Siberia with a tank that reads "Icthyo Sapien." 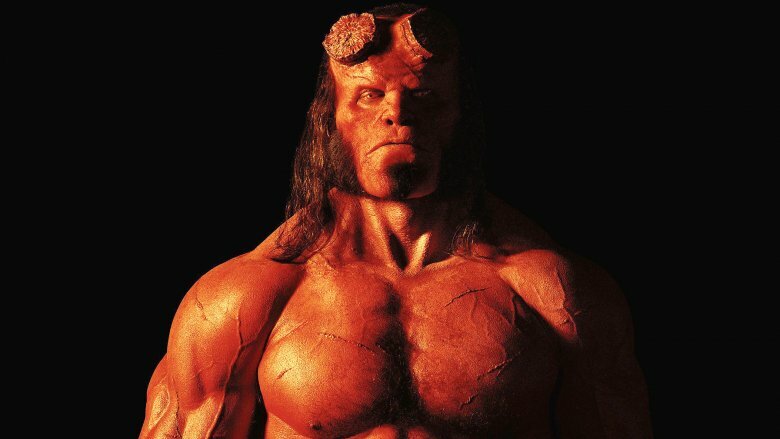 If the film ends up earning a sequel, it's a sure bet that everyone's favorite wet man will show up to help Hellboy bust some heads and investigate some lakes. 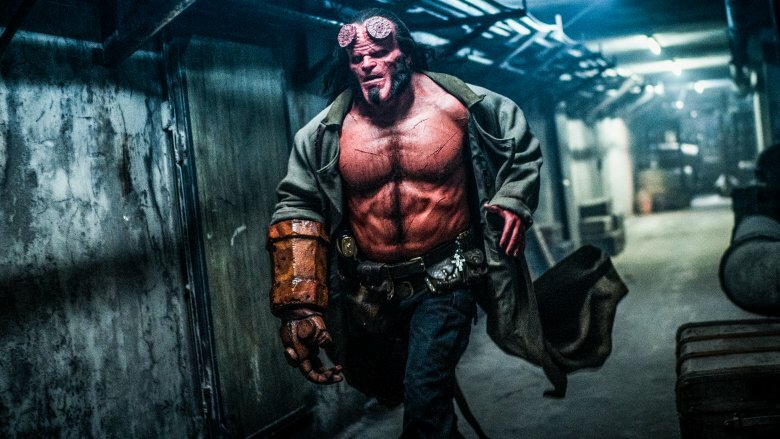 It wouldn't be a comic book movie without a post-credits stinger, and Hellboy is no exception. The scene finds the half-demon getting prodigiously drunk at his father's grave, only to be interrupted by the Lobster's ghost. Hellboy geeks out at meeting his childhood hero, and the Lobster gives a stirring pep talk to get Hellboy back on his feet. It's a cute scene, but it's also arguably the most important moment in the film. Why? Because if there's one thing that Hellboy loves doing, it's getting drunk with ghosts. More than punching monsters, more than shooting and missing targets with his oversized revolver, Hellboy just can't get enough of boozing with the dearly departed. In fact, that's how The Wild Hunt storyline in the comics starts — Hellboy's called to lead the Hunt after going on a boozy tour of Great Britain's finest ghost houses. 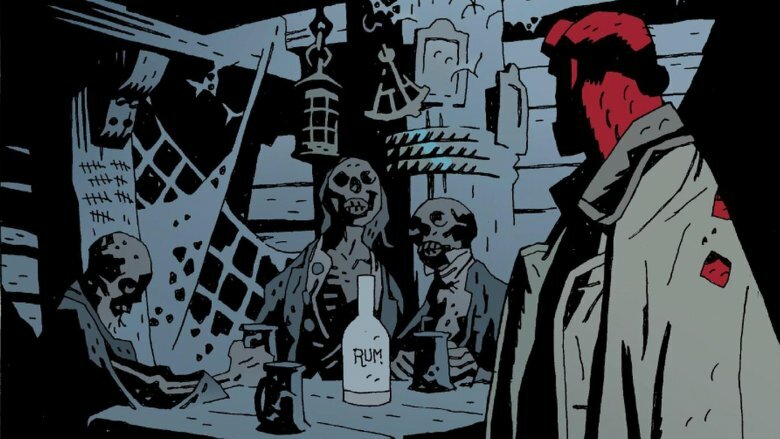 Some character beats are simply too important for any adaptation to ignore, and if you want a Hellboy movie, you've got to have a scene of him drinking it up with the great beyond.